You won’t find this being mentioned anywhere else, but I’m about to drop some knowledge. You see, the vibrant town of Heartlake City was built on greed and destruction. The thousands of acres of land the city now occupies was once a vast array of forests, open pastures and isolated jungles, teeming with all kinds of wildlife. Some even say the wilderness held natural cures and remedies for modern illnesses, with plenty of resources for everybody on the planet. Then the minidolls came, with their greed and lust for real estate, recklessly destroying the natural habitats of the animals, laying concrete wherever they say fit, and leaving pollution and destruction in their wake. Countless animals and creatures were lost, with many species – such as the domestic warg – being wiped out completely, in the name of profits and social status. Fast forward to the present day, and Oliviatech has spearheaded an initiative to preserve the remaining wildlife, with the end goal of restoring part of their natural habitat. Olivia and friends have volunteered their time to acclimatise rescued animals to the wild, and ensure their wellbeing, which is what the Jungle subtheme is all about. Domesticated animals, or those too poorly to be safely released, have since been exported to LEGO stores in special polybags. As well as providing funding for most of the rescue equipment, Olivia has contributed to the building of an animal-friendly riverside café, where visitors can get up close and personal with nature. Fun fact: I’d intended to buy all of the sixth wave Friends sets at once, and remember walking out of the store with eight sets, the Series 5 animals and a few other things. Somehow I’d managed to miss this one, and I had to go back at a later time to get it. Perhaps this wave being mixed with sets from the last wave in the store had something to do with it? That was a problem. It looks as if something’s wrong with Olivia’s right arm in the top right corner, but she’s carrying a life-preserver that just happens to blend with her shirt. I don’t think LEGO would deliberately allow a huge drawing mistake like that. Speaking of things going together: notice how she’s teasing the tiger with a big juicy bone. Who else is wondering whether it will go for her instead? Not today it seems; she’s survived to tell the tale, or at least for long enough to pose as the set’s scale reference. Oh noes, some people cry: another DSS. Unfortunately there aren’t any printed elements in this set, apart from the minidoll and animals. 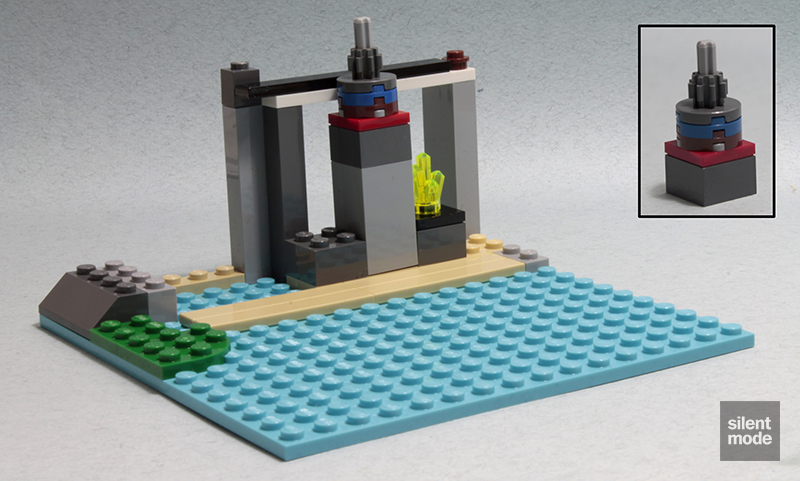 This also means we’re free to build the set without any decorations, as we usually do right here on SilentMode.tv. Making a return from Jungle Tree Sanctuary are the brand new vine parts in Lime, and there’s two of them! At the moment they only appear in Lime, though I wouldn’t be surprised to see them in another shade of green in the future. 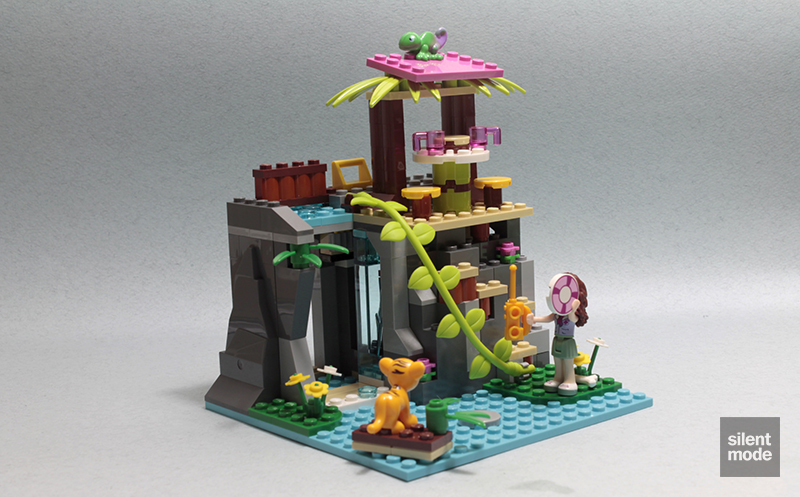 The Medium Azure 16×16 plate is still exclusive to the Friends theme, and along with its appearance in Heartlake City Pool it also shows up in Jungle Rescue Base – all one to a set. It’s going to be a while before we can create clear blue waters for a beach scene, unless someone has deep pockets and many connections. Jungle Falls Rescue sees the return of BURPs, or Big Ugly Rock Parts: the ultimate in the phenomenon of Parts Out Of Parts (POOP). These parts can be handy for quickly building landscapes, but using too many of them will create an unnatural appearance – which is often why MOCers go HAM using small slopes and bricks instead. The Trans Light Blue BURP can also be found in Arctic Batman vs. Mr Freeze: Aquaman on Ice (where you’ll get two of them) and in Sir Fangar’s Ice Fortress from the Legends of Chima theme. We get two numbered bags in this set, with Bag #1 containing the lion’s share (no pun intended) of parts. The most interesting of these parts are shown here. Parts currently exclusive to this set are the Trans Yellow rock piece (another one for the collection!) and a Medium Azure 1×8 tile (not pictured), sadly only one each to the set. 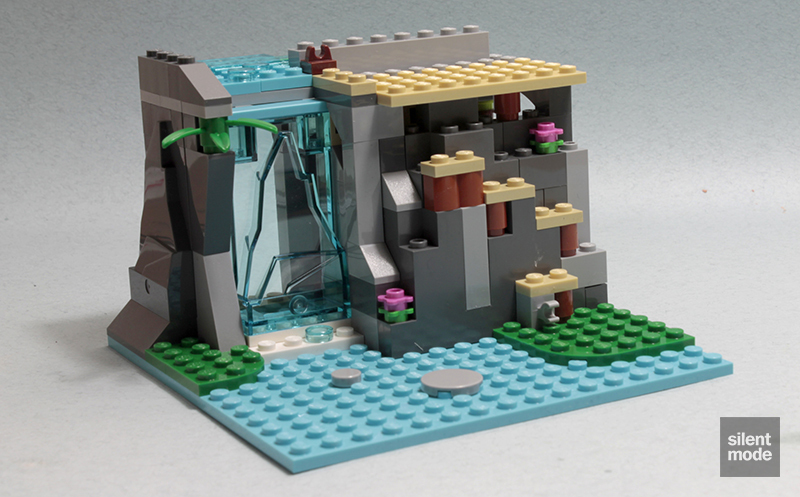 Keep those tiles and rock parts coming, LEGO. Update: it’s a Trans Neon Yellow rock piece, not Trans Yellow as incorrectly listed on BrickLink. A new part for 2014 is the 2×2 round tile with a hole in it, with the hole being large enough to accept a stud – this could be a game changer when it comes to SNOT techniques, particularly when combined with 2×2 jumper plates. 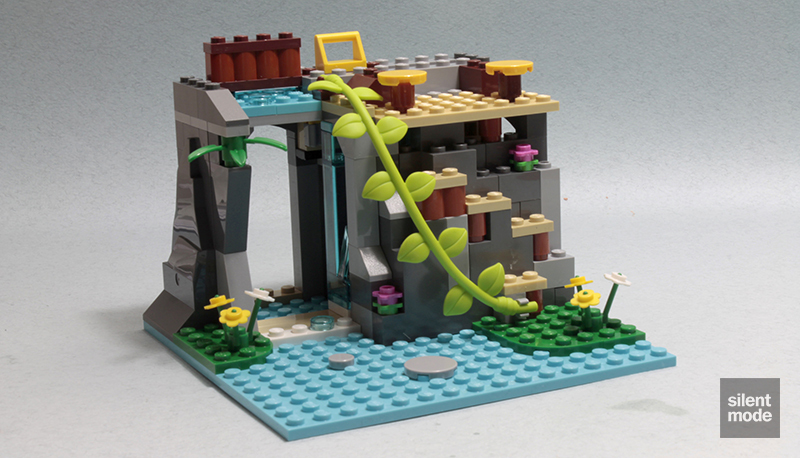 Trans Light Blue is represented, with those valuable 1×1 bricks appearing in only a handful of current sets – you can find a whopping 34 of them in the Trevi Fountain Architecture set, with your next best bet being six of them in the Mountain Hut Creator set. 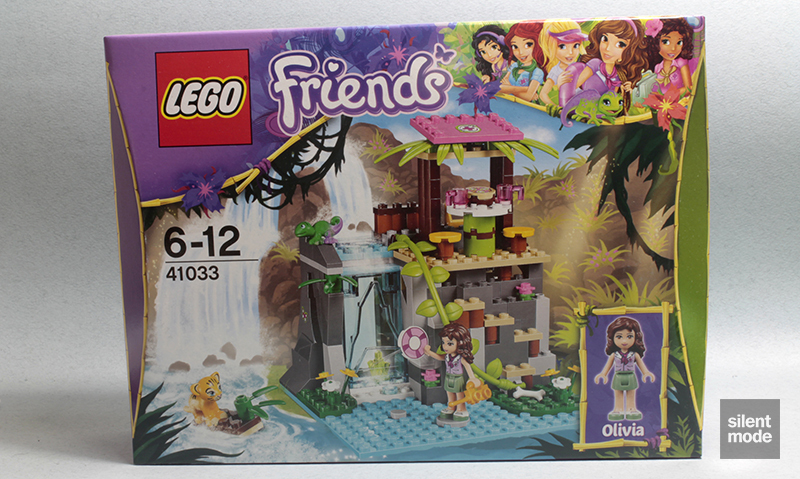 Also of note are the Dark Orange 1×1 round bricks, which currently appear in this set and Jungle Bridge Rescue, as well as three other (likely discontinued) sets. Finally we can’t ignore those 1x1x3, 1x2x2 and 2x2x3 bricks: more examples of POOP. 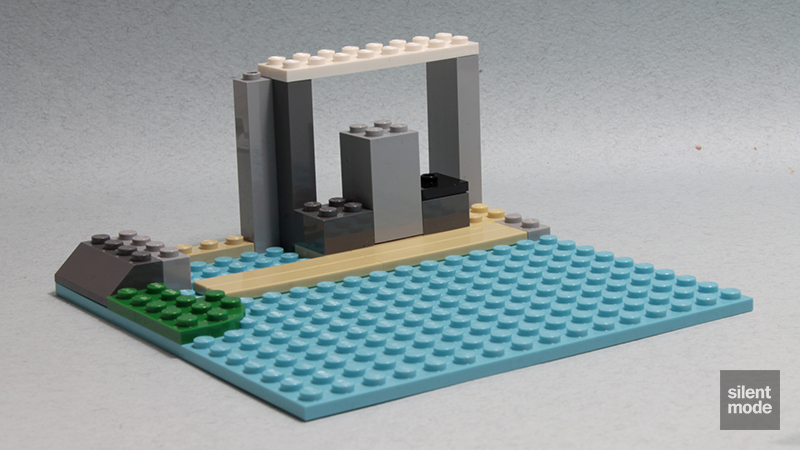 We first saw the 1x1x3 bricks in Emma’s Lifeguard Post, and this time they appear in Medium Stone Grey, which also occurs in three other sets released this year. Attempting to look modest and altruistic, Olivia ventures into the jungle wearing exactly the same outfit as Mia in Jungle Tree Sanctuary. I don’t think this has ever happened before, but we may yet see even more of it in future sets. Of course, it could just mean that Olivia and Mia are part of the same organisation. Accompanying Olivia to the ring is a tiger cub, virtually identical to the one found in Tiger’s Beautiful Temple. Thankfully there’s no bow to attach to it, because it is a wild animal after all. Ding ding! The Medium Azure plate immediately comes into play as we’d expect, and we get the placement of the 2x2x3 brick out of the way. 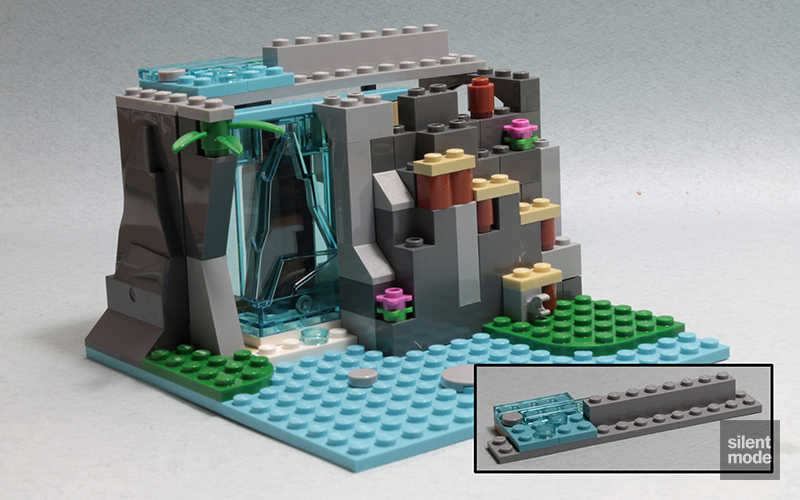 This build here is a secret door, making use of the Trans Light Blue rock part and Medium Azure 1×8 tile. 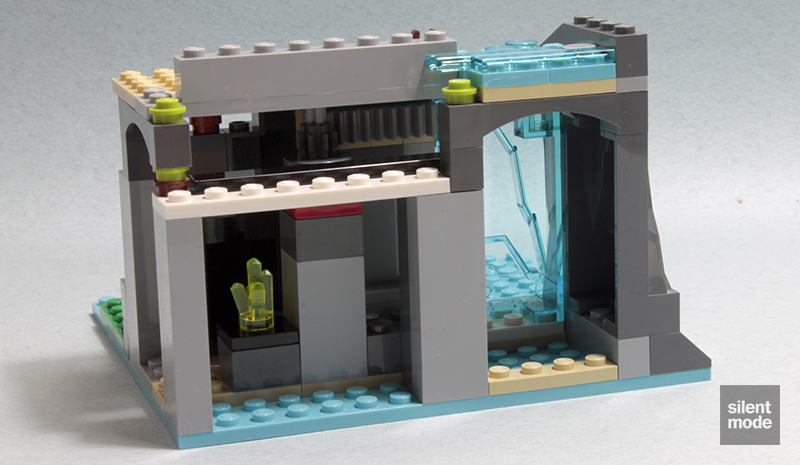 A Technic rack is also incorporated into the door, held by four Tan headlight bricks. 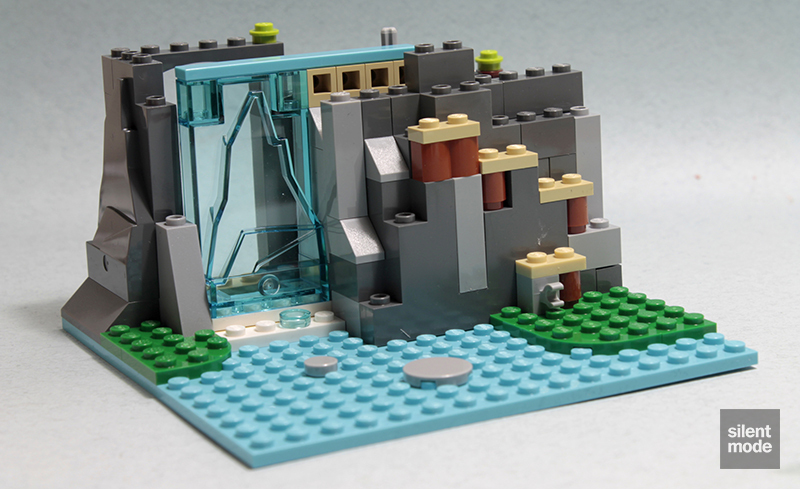 The end result is another technique for implementing a sliding door, with the Trans Light Blue rock piece acting as water from a waterfall. We place the door inside the model as it stands, but right now there’s no way of easily opening and closing the door. After adding some obligatory foliage, the door mechanism is held in place with this selection of parts. By the way: if you’re after some Medium Azure 2×4 plates (and I think some Medium Stone Grey 2×14 plates), you should be able to find them at your nearest PAB wall. When you’re done with the first bag, you should have something like this. If you look closely at the Technic axle, you’ll see it sits inside one of the stud holes in the Medium Stone Grey 2×14 plate. Doesn’t that blow your mind? A nice selection of leftovers indeed. If you don’t want them, I’ll take them. As mentioned before, Bag #2 contains a lot fewer parts than the first bag, but it also means they’re easier to organise. There isn’t anything massively remarkable in this bag, as we can find many of them in other Jungle sets, but this is one place where we find unprinted inverse 2×2 tiles in Tan: these made their debut in The Hobbit – An Unexpected Journey Games set, but annoyingly came printed. We can also see we’ve been provided with new mould 2×2 round tiles in Tan and Yellow. The Medium Stone Grey one included in Bag #1 was the old kind. In a review first, I’d managed to lose one of those uncommon Dark Orange round bricks whilst setting up a photo. It’s since been replaced with a Reddish Brown one. 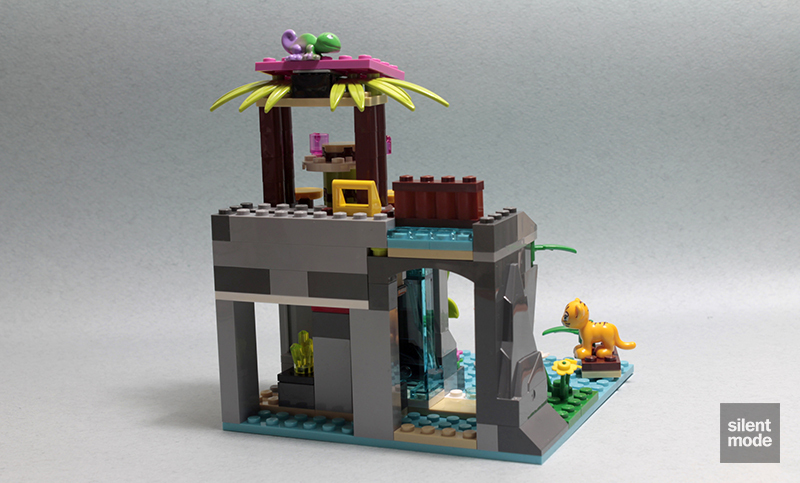 Forget what you’ve heard: this brand new animal is probably the most popular of the animals offered in this wave, likely because it appears in only two sets (the other being Jungle Rescue Base). A plain Bright Green version of the chameleon is also exclusively available in Rapunzel’s Creativity Tower in the Disney Princess theme. Either way, the chameleon occupies three studs. Let’s wrap things up with the sliding door: we require a handle to open and close the door easily. This is where this mechanism comes in, which makes use of another Technic rack. The end result is a secret door that opens as you slide the handle to the left, and closes when it’s slid to the right. 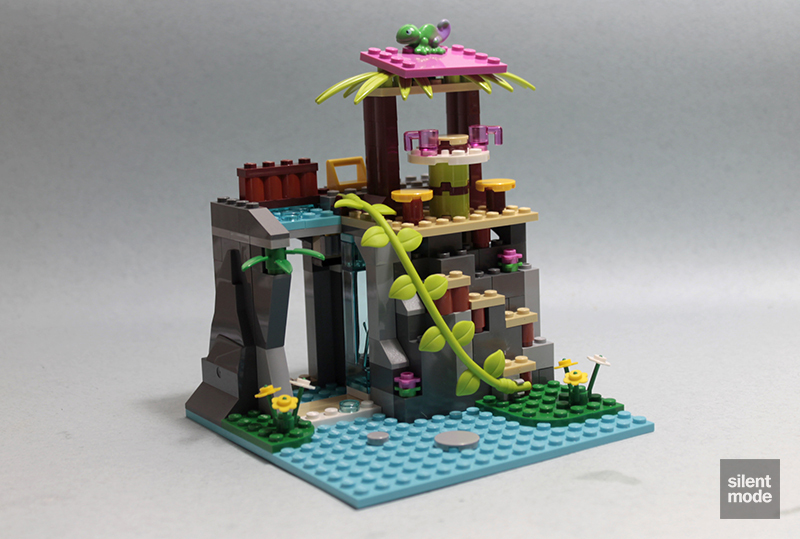 Remember when I mentioned that Technic techniques were the only thing left to introduce to Friends sets? Y’all don’t hear me. Since y’all are busy not hearing me, let’s mention that vine part: similarly to Jungle Tree Sanctuary it attaches to a pair of clips added to the base. It was a little easier to do this time around. To help cement the door handle into place, we add the café area of the waterfall, complete with table and stools, and a very basic roof to shelter visitors from torrential rain. The chameleon makes its home at the very top, blending in almost seamlessly. Those two Tan inverted tiles are used to form a small plank or raft, with the tiles enabling it to sit on top of other plates without sticking. It’s the same thing every day: the tiger decides to go for a stroll down the river, and for some reason Olivia thinks a life-preserver is going to save it. Doesn’t she know cats can swim? Another shot of that secret cave behind the waterfall. Oh the stories I could come up with, if this review wasn’t intended to be clean. 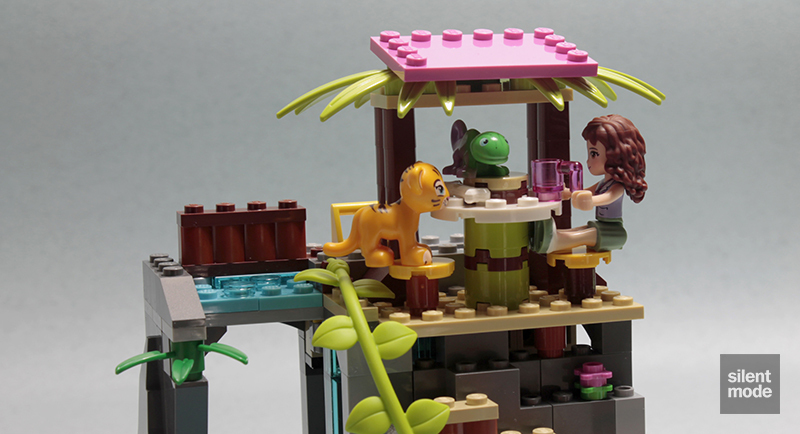 Occasionally the animals join Olivia for a spot of afternoon tea, after a hard day’s work. Isn’t that nice? We can’t fail to notice that we have a spare vine for some odd reason. A spare Dark Orange 1×1 round brick would have been nice! but I’m not complaining. More kudos is due for the sliding door mechanism, making use of Technic elements: I wouldn’t have been able to figure it out in a million years, and it’s the set’s killer play feature. It was also interesting how the BURPs were incorporated into the design in a way that makes them almost unnoticeable. As clever as the build was, the ceiling of the base (the end of Bag #1) felt flimsy as it was attached, though the whole thing is still holding up. 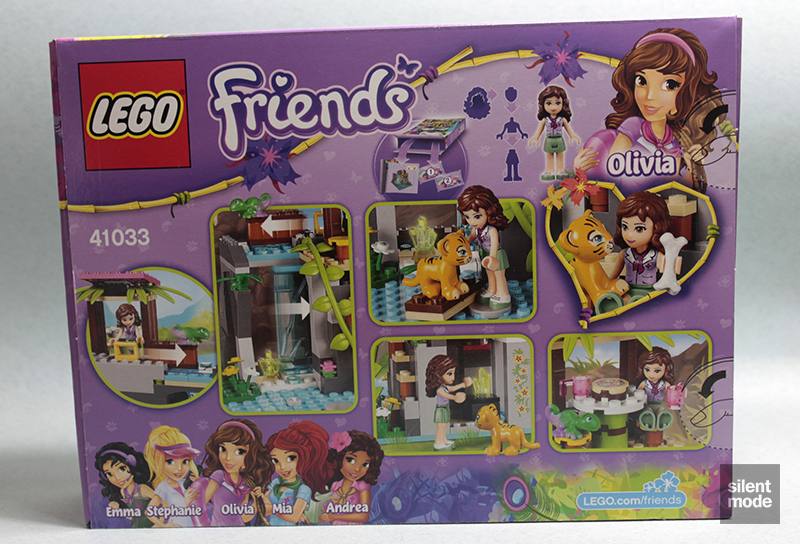 I’m also not keen on Olivia having exactly the same outfit as Mia in Jungle Tree Sanctuary – even though Mia is pictured on the back of the box as having a blue shirt, there may be a good reason for it. Taking everything into account, I’m giving this set 7.4/10 – unintentionally just short of a Silent Approval.